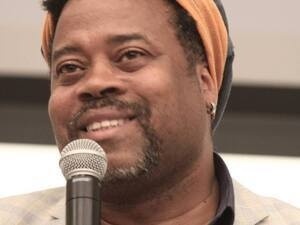 Join writer and cultural critic Greg Tate for a workshop on creative writing and music journalism. Tate is a writer, musician, and cultural provocateur who lives and thrives atop Harlem’s Sugar Hill. His books include the acclaimed essay collection Flyboy in The Buttermilk, Flyboy 2: The Greg Tate Reader, Midnight Lightning: Jimi Hendrix and The Black Experience, Brooklyn Kings/New York City’s Black Bikers (w/photographer Martin Dixon) and Everything But The Burden—What White People Are Taking From Black Culture. He is currently finishing work on Beast Mode:Iconic Gods and Monsters of the Bloodthirsty Black Atlantic and Beyond for publication by Farrar, Strauss, and Giroux in early 2020. Tate has been a visiting professor at Columbia, Yale, Brown, San Francisco State, Princeton University, and Williams College. He was a staff writer at the Village Voice from 1987 to 2003. His writings on culture and politics have also been published in the New York Times, The Washington Post, Artforum, Rolling Stone and VIBE. Cosponsored by Musical Studies Program and Department o Africana Studies.